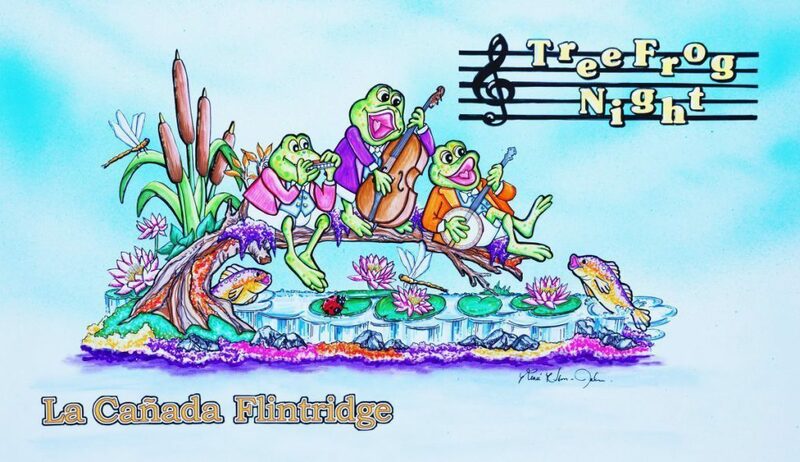 Over the holiday break, my mom, my brother, and I volunteered to work on the La Cañada Rose Parade float, titled “Tree Frog Night.” The shift we worked was from 9pm to 1am, and with the temperature outside being at 35 degrees, my hands quickly lost feeling within twenty minutes. This made the work we did more difficult than I expected, especially since we weren’t allowed to wear gloves throughout the entire shift. My brother and I spent the evening running over to the heat lamps and attempting to warm our hands, only for them to feel like they were frozen again five minutes later. When my family and I got there, we were assigned to trimming and stripping the leaves off of rose stems. At the next station, we had to cut the rose stems to a certain height, and stick them into a small vial under scalding water. This was meant to preserve the freshness of the flowers until parade day. In the end, I had filled about 500 vials in total with roses, which all came together in a colorful array of yellow, white, orange, and red flowers. I had never seen so many roses in one place in my life. But sorting out the roses wasn’t the only job to do at the float building. Around me, there were also people gluing leaves to the frogs’ heads, attaching roses to boards, and cutting fruits that were glued to flowers. I was impressed that La Cañada was able to create their own beautiful float from volunteer efforts alone. Spending time working on the Rose Parade float was something I wasn’t expecting to enjoy. In the end, I had a lot of fun working on the parade float. Even though I couldn’t feel my feet, hands, or fingers, I had an amazing time and look forward to decorating the Rose Parade float again next year.